I confess that I don't wear socks as much, simply because I don't fancy closed shoes very much. It was only last year, during our London vacation that I got to appreciate wearing closed shoes! I bought a pair of FitFlop closed shoes and I was looking for a nice pair of socks to use it with. Unfortunately the only ones I saw (and eventually bought) are those nylon (stockings-like) ballet flats socks. I don't know what you call them - Hahaha! So I bought them and used them the whole trip. Thing was it would sometimes crumple up while I walk and so I needed to adust it from time to time (Take off the shoes to fix the fit of the socks). I'm quite the late bloomer. It was just recently that I realized how socks can help make shoes more comfy. I realized that only last year during a trip to Tokyo! Hahaha.. So whenever I was to wear closed shoes, I wanted to wear socks - thing was, the right kind of socks for the different kinds of shoe we have. The generation now is quite lucky because there are all sorts of socks around! During my time, we would need to fold the front part of the socks to make our socks look and be *ankle* length! Hahaha!! Apparently, these are called INVISIBLE SOCKS! Hahaha.. I really got interested because I just bought my first pair of Paez shoes in white! So before wearing it, I'm quite ceremonious - hahaha!! Everything needs to be in order. First, since it's white - I didn't want the shoes to be dirtied easily, so I bought a Nano spray. I already sprayed it last Sunday. Hahaha!! Next order was which socks to wear - I was ready-ing my old socks, and then I saw the picture above!!! I got 2 white and 2 nudes. I was planning to get in grey and blue! But then thought, I wasn't going to wear them everyday! hahaha.. So I told her that I wished there were socks like those for kids - she said she will have! Yahoooo!! :) It has been ages since I wanted these kinds of socks for the kids! Finally, there will be!! Her stocks will arrive next month! I'm so excited! They will cost P80.00 a piece for kids size. 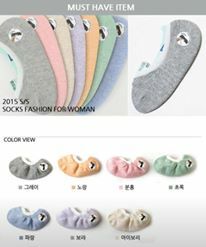 So if any of you are interested in this kind of socks - please send my friend an inquiry (and please make an order too!